Koko Newport is priestess at the Goddess Temple in Glastonbury. Here she talks about how she got involved and how the Goddess movement is expanding. The first priestesses of Avalon self initiated in 2000. I understand it grew from Kathy Jones’ sacred drama plays. I bought a B+B in Glastonbury in 2001, at that time the temple was just in the process of being organised by Kathy as a place of focus and offering the possibility to come together and be with like-minded people, honouring the great mother. Staying with me were women who had come to decorate it. 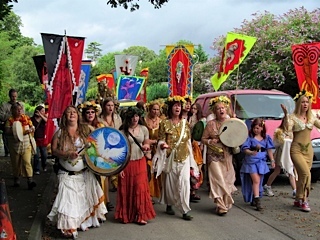 In the Summer, when the conference came around, I was intrigued enough to buy a ticket and was blown away by the dedication and energy of the women and men involved and decided to train as a Priestess of Avalon. I was 60 and had never felt more at home with myself. The numbers of people taking the training has increased every year, in my year we were just 13 and last year’s group were more than 30. Also, there is an increase worldwide, women being inspired and teaching in their home lands – Goddess conferences in America, Australia, Brazil, Mexico, South Africa, Holland, Spain, Germany, Austria, Hungary, Argentina, with more being considered. Closer to home we are expanding out from Glastonbury and I would dearly love a temple in Bristol, indeed in all cities, why not? The energy of the Goddess has always been present. I choose to be part of a movement that embraces and brings it into a greater awareness in a positive way. Each year, after the conference in Glastonbury, the feeling of love in the air is tangible. The effect of unconditional love is humbling but also a powerful force for the good. I do believe there is a new wave, a generation of young women looking for answers, needing to be heard. Through connection with the Goddess, I have been shown a way to look at my personal growth in relationship with how I live, how I treat my neighbour, my children, my garden, the earth…. I believe the Goddess movement offers a way of relating to each other and our mother earth in an inclusive way, we really are all one. I would hope others could accept and not feel threathened by the Goddess, by this pull by so many to embrace the old ways, to stand in our power, to speak our truth. She really does offer abundance to all, she loves us unconditionally and wants us to have every thing we desire. Koko runs a year long course for women, Queen of Yourself. 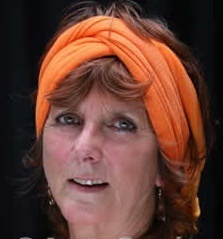 To find out more about that or the work of the Goddess Temple, email her or call her on 07870 563882.